Apple’s mainstream products are great. The iPhone is fantastic, MacBooks are wonderful and the iPad is a joy to wield. However often the accessories for these products fall short of the high standards I expect. Apple Earbuds are terrible and the iPhone bumper case deteriorates after a few months of use. This has meant that my pleasant surprise after some use of the iPad Smart Case has restored my faith. I’ll start with my two negatives. And they are small ones. The first is that it is a little finicky getting the cover open. You have to sort of pinch underneath and use your nail to flip it open. At first I thought this would drive me nuts but now I’m used to it – I barely notice. My second issue comes with the fact that I eat my lunch and use my iPad. Because of the case creating a lip around the edges the iPad, I have found that crumbs find their way into the corners and can be difficult to clean out. I should hope that everyone else in the world is less of a slob with their expensive Apple tablet, but then again I have seen children dangling out of a prams with a chocolate smeared iPad in their hands. If you get crumbs on your screen while using the case, you might have to take the whole device out to clean it off properly. Positives are plentiful. The Smart Case fits snuggly and securely without adding too much bulk to the device. It feels sturdy and safe even though the material the case is made of is light. The case has spaces for the dock and earphone jack as well as raised “buttons” on top of the volume rocker and sleep button so they can all be used easily while the case is in action. The cover of the case performs all the functions of its predecessor, the Smart Cover. It provides a perfect angle for typing as well as watching a video depending on how you flip the iPad. It also allows you to wake and sleep the iPad simply by opening or closing the cover thanks to the magic magnets in the cover. The IPad Smart Case is the cherry on top of an already amazing product. It should come with the iPad as standard because it adds functionality that should be enjoyed by all iPad owners. 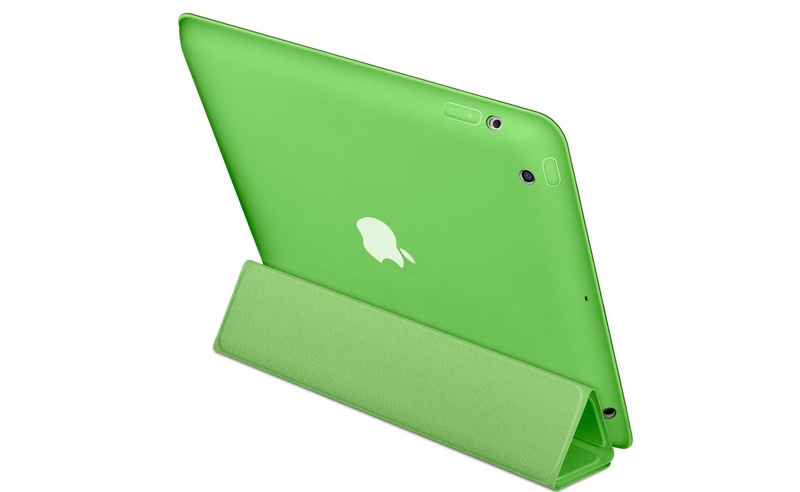 Plus it has the Apple on the back so you don’t have to have a case with a circle cut out of it to show your iPad pride! This entry was posted in Geek, Technology and tagged Case, Cover, iPad, Magnets, Smart by Jonathan Day. Bookmark the permalink.